Drives thin wall clear polycarbonate tubing, 2 5/8 (68mmid) x 2 ¾” (71mmod), perfectly optimized barrel size designed to collect long cores with minimal disturbance or drawdown. Polycarbonate Core Barrels - proven to produce the best quality samples with minimum amount of sample loss, 2 5/8” (68mmid) x 2 3/4” (71mmod) thin walled barrels with chamfered (sharpened) ends, poly end caps, core extruding plugs (optional $17 each). Available in standard lengths of: 60 cm ($45) 1.2 m ($67) and 2.4 m ($111). Simple, versatile, and easy to use. Thin-wall core barrels and positive check valve assembly collects quality samples in a variety of sediments and conditions. An excellent quality brass check valve provides good flushing and positive vacuum to retain cores during recovery, without core catchers. Upon retrieval, one must plug the bottom of the core tube before breaking the air-water interface (with core extruding plug or poly end cap) to prevent loss of sample. Clear polycarbonate core barrel material readily available at most plastic distributors. Core extruding plugs allow one to incrementally extrude sediments upward with aid of a Core Extruding Apparatus. Core barrels can easily be drilled/plugged (for pore water extraction), serrated, cut and split to meet the special needs of the investigation. In shallow lakes: Aluminum holobar extension rods to maximum water depth up to 15m. Provides: good “feel” for the sediments, good control of penetration depth, long cores of the water-sediment interface. 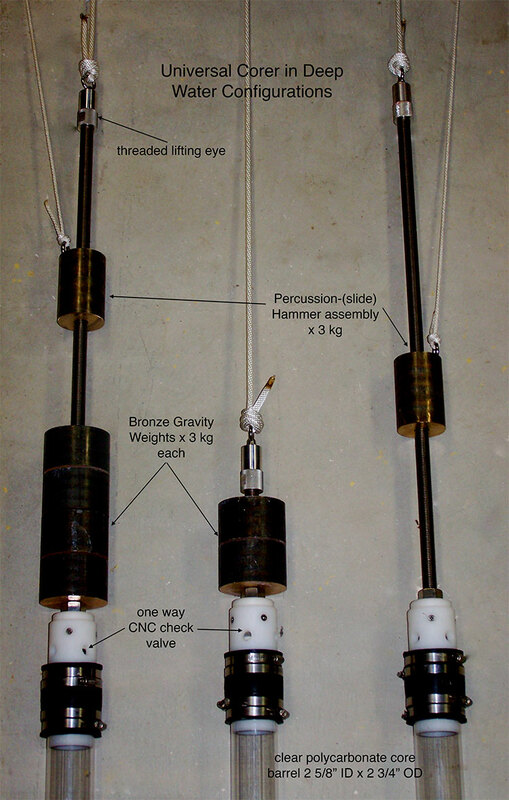 In deep lakes: Polyester Lowering Line with Bronze Gravity Weights and/or Slide hammer assembly. Sampler is gently lowered into the sediments to recover undisturbed samples. For deeper penetration, the slide hammer assembly can be raised and dropped (on a separate, small diam. wire, not included) “T”-handle. In shallow water or SCUBA: “T”-handle with or without a Slide hammer assembly can be used in shallow marsh and wetland conditions. How it Works… The Universal Corer was designed to collect long undisturbed cores of the mud water interface. The corer head drives clear polycarbonate core barrels (2 5/8” ID x 2 ¾” OD) to a maximum sediment depth of 2.4 meters. The custom (CNC) check valve was specially designed to allow water and mud to free flush through the core head/barrel with minimal sample disturbance. 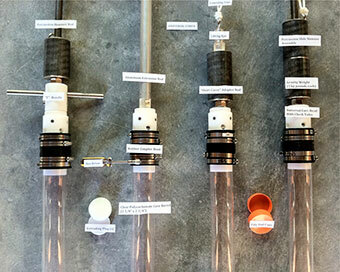 After the core barrel is pushed into the sediments (see methods below), the sampler is hoisted upwards, the check valve seats, and a partial vacuum is created to hold the sample inside the core barrel. Since the assembly does not require core catchers, it is necessary to “Plug or Cap” the end of the Core Barrel before it is lifted into the air. Otherwise, you may lose all or part of a sample. With the Extruding Plug in place, double seal the ends of the barrel with Poly End Caps. The Core Extruding Plugs can be used with or without “O” rings depending on the nature of the investigation and sediment type. The core barrel is now ready for transport and prepared for the extruding process with (optional) Core Extruding Apparatus. Attaching the Barrel…The core barrel is easily attached and removed from the core head by loosening/tightening the Rubber Boot Assembly. Use the Hex Driver to tighten and loosen the LOWER band clamps only. YES” is written on the lower clamps as a reminder … OK to loosen or tighten. “NO” is written on the upper clamps as a reminder … “Do not touch”. Fully slide core barrel into core head approximately 10 cm and secure lower hose clamps very tightly. If you don’t secure the band clamps you will fail to collect a sample (lack of vacuum seal) and risk losing the Core Barrel entirely. Methods for Deployment… The Universal Core Head is easy to use and can be deployed in many ways. A stable work platform is required for any coring operation. Ice cover is the best working option, but many are successful on a well-anchored raft or pontoon. Before deploying the sampler, be sure to tie off the end of the lowering line to the platform to prevent inadvertent loss of sampler. Below, please find some common deployment techniques. “T”-HANDLE: The corer can be deployed in shallow water or as a diver with the “T”-Handle. Secure the “T” Handle to the core head securely. An optional Percussion Slide Hammer Assembly can be mounted atop the handle and aid in driving (retrieving) the corer into sediments. EXTENSION RODS: Aluminum Holobar Extension Rods are available (1.2 and 2.4 meter lengths) to deploy the sampler in shallow water to a maximum depth of 20 meters. Securely tighten the stainless steel couplers between before deployment. This method allows good “communication” between the operator and the core head. It allows one to measure how far the corer has been pushed vs. how much mud has been collected. This is an important measurement in determining any “core shortening” that may be occurring. The “T” Handle and (optional) Percussion Slide Hammer Assembly can be mounted atop the extension rods and aid in driving (and retrieving) the corer. 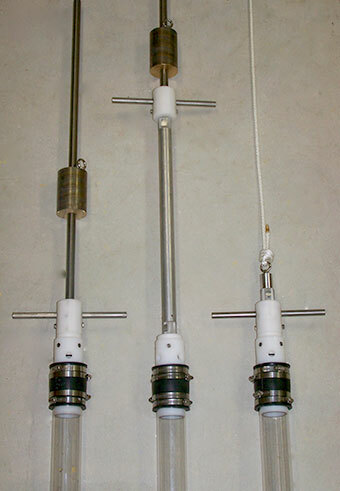 GRAVITY WEIGHTS: The sampler can be deployed in deep water with Gravity Weights. The number of Gravity Weights needed depends on the target depth and the type of sediments encountered. A maximum of four (4) weights can be added to the core head. For collecting short cores of mud water interface, use the “Short Corer Adapter Rod” to allow easy/ergonomic use of a single Gravity Weight. The use of more than one Gravity weight will require the use of the Percussion Slide Hammer Assembly. Tie the sampler to strong non-stretch wire or rope (with minimum test strength X 500 pounds) to the Lifting Eye. Determine the depth of water and slowly lower the end of the core barrel to mud water interface. Do not allow the corer to freefall through the water column since it will not penetrate properly and your sampling effort will probably fail. Allow the sampler to gently enter the sediments until the lowering line slightly “slacks”. Gently pull upwards on core head with care not to “shock” the Lowering Line and quickly reel in the sampler. Seal the end of the barrel with a Core Extruding Plug or Poly End Cap before lifting into air. 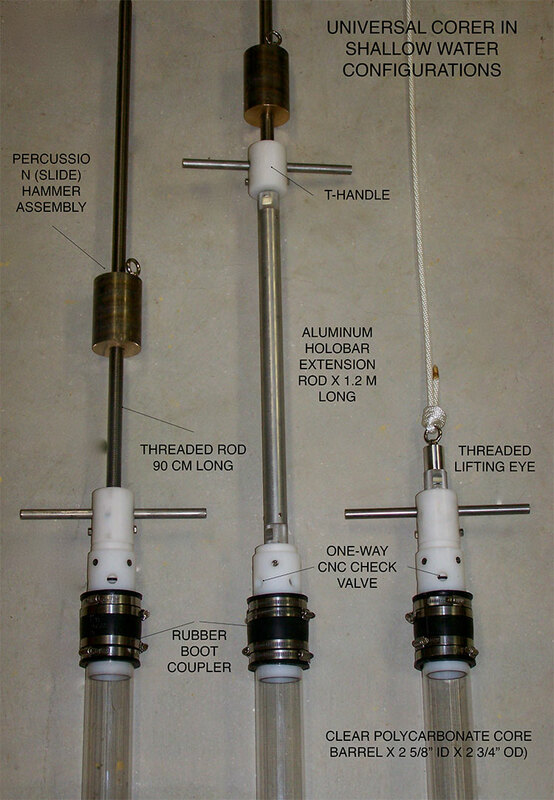 PERCUSSION SLIDE HAMMER ASSEMBLY: The 90 cm long Slide Hammer Rod allows one to add both Gravity and Slide Hammer Weights when attempting to collect long a core in deep water. The Lifting Eye should be fully secured at the core head and the line/wire before deployment. The assembly can hold a maximum four (4) Gravity weight and the Percussion Hammer for a maximum weight of approximately 60 pounds. Tie the sampler to strong non-stretch wire or rope (with minimum test strength X 500 pounds) to the Lifting Eye. Determine the depth of water and slowly lower the end of the core barrel to mud water interface. Do not allow the corer to freefall through the water column since it will not penetrate properly and your sampling effort will probably fail. Allow the sampler to gently enter the sediments until the lowering line slightly “slacks”. On a separate line attached to percussion hammer lifting eye, gently pull upward on the percussion hammer. Allow the hammer to drop and measure your deployment progress on your Lowering Line. The Corer should be stabilized by the Lowering Line, but allowed to slack when slide hammer strikes the core head. It is very effective (and minimizes sample disturbance) to hammer in short 15 to 20 cm long strokes. Gently pull upwards on core head with care not to “shock” the Lowering Line and quickly reel in the sampler. Seal the end of the barrel with a Core Extruding Plug or Poly End Cap before lifting into air. This method requires some time and effort to master, but produces good quality samples in deep waters.